Just in time for summer bike season, Walk Score (the company best known for rating the walkability of neighborhoods across the country) awarded Chicago the number 10 spot on its list of most bikeable American cities. Sure, we lag behind Portland, San Francisco and New York, but we beat Austin! Hipsters unite. Of course, not all Chicago cyclists are hip young people riding vintage Schwinns or fixie conversions with neon aerospokes. Some are newbies (a.k.a the people who had no idea what I was referring to just now), while others are hard-core athletes accustomed to flying down Lakeshore Drive at maximum velocity. We&apos;re a diverse bunch, and our many varied bicycle-friendly neighborhoods prove it. The Chainlink- an online community for Chicagoland cyclists to share info on bikes, routes, rides and events. Handlebar- A restaurant/bar that supports bicycle advocacy. Come for the beautiful beer garden, stay for the best veggie brunch in the city. Chicago Cycling Club- Become a member! Upcoming events include a ride through the 45th Ward (Parks & Burgers) and a Memorial Day 35-mile round trip to Frankfort, IL via the Old Plank Bicycle Path. Critical Mass Chicago- Group bike rides start at Daley Plaza at 5:30 p.m. on the last Friday of each month. Free, fun and perfect for meeting fellow cyclists. "Bike the Drive" 2013- May 26. 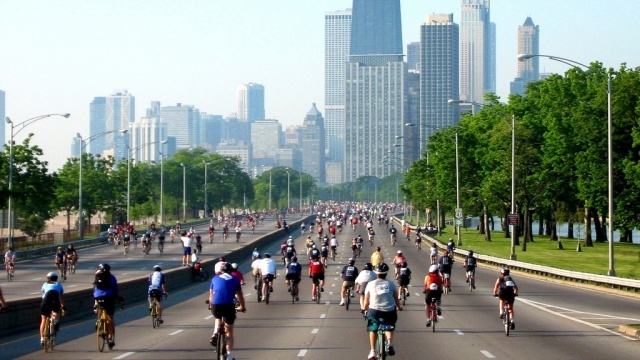 Register for five hours of car-free biking down Lakeshore Drive. Best summer kickoff party ever. 10th Annual World Naked Bike Ride- June 8. If you dare. The city&apos;s Divvy bike-sharing program launches in June, with 4,000 three-speed bikes painted "Chicago blue" available at 400 docking stations and priced at $7 per day. Hopefully, this new infrastructure will continue to grow Chicago&apos;s budding cyclist community and convert more city streets to be bike-friendly to all. Are you as surprised as I am to not see Logan Square on this list? Where are your favorite places to meet, shop and ride in Chicago? Leah Pickett writes about popular culture for WBEZ. Follow her on Twitter, Facebook, or Tumblr.